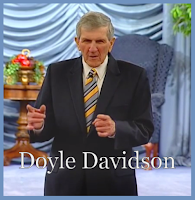 Join Doyle Davidson and other ministers of the gospel as they minister with power in word and in song. Today Doyle, along with the Body of Christ, pray the name of Jesus. Doyle concludes the program sharing of a time when praying the name of Jesus the power of God broke through, and caused him to overcome. Kathie Davidson preaching the gospel, and ministering that through believing the gospel we can overcome curses in our lives.